INGREDIENTS: Crushed Tomatoes (tomatoes, salt), Seasoned Chicken Crumbles (chicken thigh meat, salt, dehydrated garlic, spice, soy protein concentrate, natural flavoring), Water, Heavy Cream (milk), Fennel, Extra-Virgin Olive Oil, Sweet Onions, Basil, Garlic, Sea Salt, Chicken Base (cooked chicken meat, salt, soybean oil, vegetables [celery, carrots, onions], dehydrated potatoes, natural flavoring, turmeric), Rosemary, Black Pepper,. Allergies: Contains soy, milk. 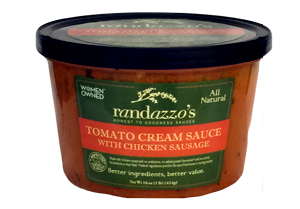 A true combination of favorite Italian delights like whole plum tomatoes, fresh fennel, garlic, extra-virgin olive oil and crumbles of sweet, Italian chicken sausage, this sauce looks as great as it tastes. A touch of real cream adds to the richness while pieces of real basil leaf create a sweet, earthy finish. This sauce is best served over spaghetti, linguine or fettucini, but better served over pappardelle. Sold 16 oz units, 6/case.